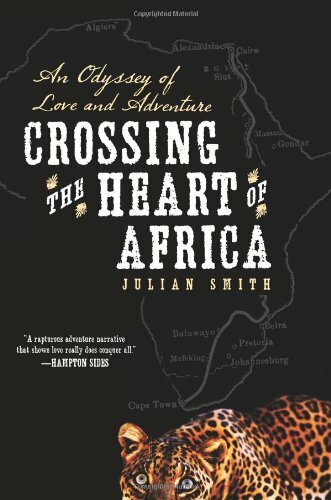 Description: The amazing true story of Julian Smith, who retraced the journey of legendary British explorer Ewart "The Leopard" Grogan, the first man to cross the length of Africa, in hopes of also winning the heart of the woman he loved. In 1898, the dashing young British explorer Ewart “the Leopard” Grogan was in love. In order to prove his mettle to his beloved—and her aristocratic stepfather—he set out on a quest to become the first person to walk across Africa, “a feat hitherto thought by many explorers to be impossible” (New York Times, 1900). In 2007, thirty-five-year-old American journalist Julian Smith faced a similar problem with his girlfriend of six years . . . and decided to address it in the same way Grogan had more than a hundred years before: he was going to retrace the Leopard’s 4,500-mile journey for love and glory through the lakes, volcanoes, savannas, and crowded modern cities of Africa. 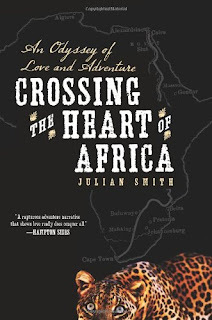 Smith interweaves both adventures into a seamless narrative in Crossing the Heart of Africa: the story of two explorers, a century apart, who both traversed the length of Africa to prove themselves . . . and came back changed men. Mentions one of my favorite movies "The African Queen" and I learned a little more about the facts that inspired the book - must go watch again this weekend - I LOVE that movie! Julian travels through Rwanda and discusses his experiences and how the country has changed since the horrific events of the genocide. Cannibals -- sorry that description was nasty! "Vicious animals, biblical weather, ferocious native tribes, incurable diseases unknown to science. There were more ways to die in Africa than there were crocodiles in her rivers on lions on her savannahs." "Grogan thought missionaries upset Africa's traditional cultures more than they helped. Such men should be caged, or at least prevented from running loose amongst the natives." "I think of Bogart and Hepburn at the end of The African Queen, getting married by the captain of the Luisa, the fictional version of the Graf van Gotzen. They're about to be hung as spies by the Germans, but they're beaming. What matters is that they're being joined forever, even if their lives are about to end. Romeo and Juliet, Heathcliff and Catherine, Roxanne and Cyrano--death always seems to shadow true love in fiction, as if the only way to earn the perfect partner is by paying the ultimate price."